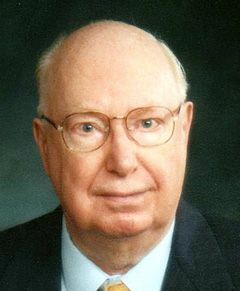 Born in Catskill, New York, Hiram Lasher received his doctorate in veterinary medicine from Cornell University in 1942. After five years of private practice in New York, Hiram was hired as a poultry pathologist for the state of Delaware. In 1950, he resigned his state job to become a founder of Delaware Poultry Laboratories (DPL), later to become Sterwin Laboratories. Hiram resigned from Sterwin in 1979 to found Intercontinental Biologics (ICB). In 1980, ICB was purchased by Intervet, with Hiram remaining on its staff for two more years. Finally, in 1982, he formed Lasher Associates, Inc, an international consulting firm, in which he stayed active until 2009. Hiram’s career impacted the poultry industry in many ways. During his days in practice, he tested over one million chickens for Salmonella pullorum, thus significantly contributing to its eradication in his home state. Then, early in his tenure at DPL/Sterwin, he helped establish the first windowless house for production of SPF eggs. He later obtained a federal license for the first infectious bursal disease vaccine. He also pioneered the use of bivalent infectious bronchitis vaccines. Later, as a consultant, Hiram assisted many fledgling vaccine companies around the world in bringing products to market. Hiram was a charter member of the American Association of Avian Pathologists (AAAP). The numerous awards bestowed upon him include the Delmarva Poultry Industry Medal of Achievement, Order of the First State, Service to Agriculture Award by the University of Delaware, the AAAP Special Service Award, and Honorary Life Membership of the WVPA. In addition to his professional activities, Hiram was a passionate philanthropist and civic activist. His generosity funded scholarships, helped endow a major academic chair, built a Boy Scout dining hall, and supported renovation of the facility housing the University of Delaware’s poultry diagnostic laboratory. He served his community by proactive membership on boards of the state department of education and of the directors of Beebe Hospital. These were his major “leisure activities”. Hiram was predeceased by a son, Steven. He was survived by his wife, Bertha, and by children, Sandra, Denise, Douglas, Dennis, Michele and Michael. WVPA thanks Vergil S Davis and Jack Gelb for compiling this profile.